Grilled chicken is a good call any time you need a quick answer for dinner. Here’s a fast, easy way to make that chicken you’re grilling into something new, different, and really, really good. California Grilled Chicken takes that caprese salad combo tomato-basil-mozzarella and makes it the main event. 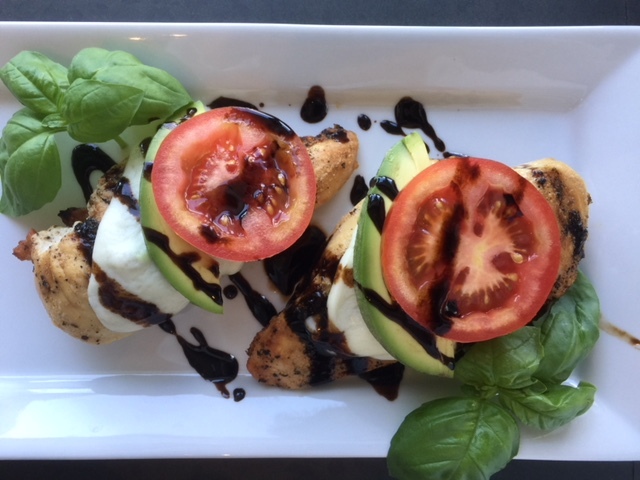 Chicken breasts are lightly seasoned and grilled, then topped with a warm, melty-mozzarella, fresh tomato, basil and avocado slice. Drizzled with a quick balsamic glaze, you’ve got something that looks and tastes like it came from a restaurant. But it didn’t. Buy your mozzarella pre-sliced for speedy prep. Use whatever slices you have left to make a quick caprese salad another night this week. You can find pre-sliced mozzarella, balsamic glaze and everything else called for in this recipe at Trader Joe’s. Heat grill to medium high. Lightly brush chicken breasts with olive oil. Season with garlic powder, Italian seasoning, Kosher salt, and freshly ground black pepper. Grill chicken until internal temperature reaches 165º F on an instant-read thermometer. Top chicken with mozzarella and cover grill to melt, 2 minutes. Remove from grill and top with avocado and tomato slices. Drizzle with balsamic glaze, garnish with basil and serve.